Antioxidants remove potentially damaging oxidizing agents – known as free radicals – from within the body. Free radicals are very unstable molecules with unpaired electrons formed during normal metabolism, cellular processes and from external factors. They may be generated by strenuous physical activity; physiological processes, especially in defense against microbes and other foreign substances; and especially exposure to harmful environmental factors, such as smog, ozone, chemicals, drugs, smoking and radiation. 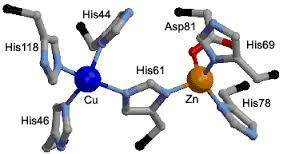 Normally molecules have paired electrons to improve stability. When a molecule is missing a paired electron — as is the case with free radicals — it attacks the nearest stable molecule and steals an electron. The attacked molecule then becomes a free radical itself, which can quickly cascade resulting in the disruption of cellular function. The body’s defense system against this cascade of events is antioxidants. 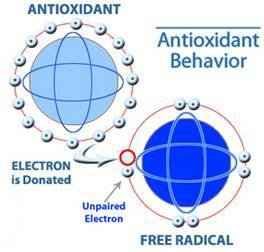 Antioxidants neutralize free radicals by donating one of their own electrons preventing the free radical from stealing an electron. These defenders basically sacrifice themselves to protect your body from damage without becoming an electron-scavenging free-radical also. Exogenous antioxidants are available through the diet and include amino acids (N-acetyl-L-cysteine, taurine and L-glutathione), carotenoids (beta-carotene, lycopene, lutein and zeaxanthin), minerals (selenium and zinc) and vitamins C and E. Endogenous antioxidants are produced in the body and include ubiquinone/ubiquinol (CoQ10), alpha lipoic acid, and superoxide dismutase (SOD), the master cellular defense enzyme. However, supplementation of endogenous antioxidants is essential since many factors – the normal aging process, medications and oxidative stress – have been found to compromise their levels in the body. Carotenoids (or carotenes) are colorful, fat-soluble compounds that occur naturally in many fruits, grains, oils and vegetables – such as apricots, whole grains, palm oil, carrots, sweet potatoes, squash, and spinach. Plants produce carotenoids to attract insects for pollination and animals for seed distribution. 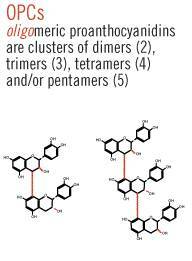 These compounds also act as a natural sunscreen, protecting plants from ultraviolet light. Alpha, beta, and gamma carotene, the most popular carotenoids, are known as provitamins because they can be converted to active vitamin A.
Astaxanthin is a pigment responsible for the pink-to-red colors found in crustaceans, salmonoids and other fish, as well as algae. 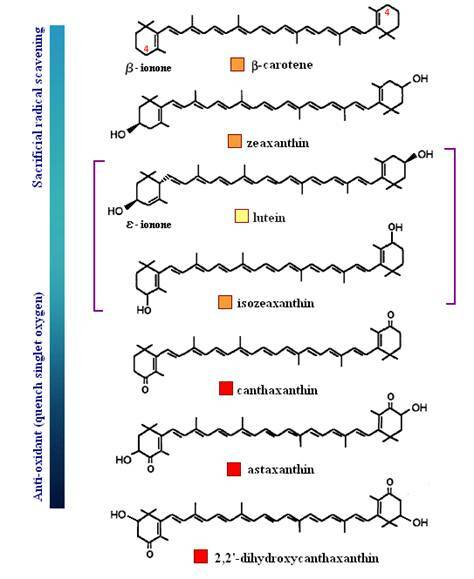 The antioxidant properties of astaxanthin are more potent than those of ascorbic acid (vitamin C), beta-carotene and d-alpha tocopherol (vitamin E). Astaxanthin is particularly useful in skin and eye health due to its powerful ability to absorb ultraviolet, especially UVB, rays. Lycopene, the hydrocarbon carotenoid that gives tomatoes their red color, is one of the most potent antioxidants. Clinical studies have shown that lycopene not only supports prostate health, but also helps maintain heart, eye and skin health. Lutein and zeaxanthin provide the yellow-to-orange pigments found in corn and leafy greens, such as kale and spinach. Both are believed to function as protective antioxidants in the macular region of the human retina. Lutein also plays a key role in maintaining skin and cardiovascular health. 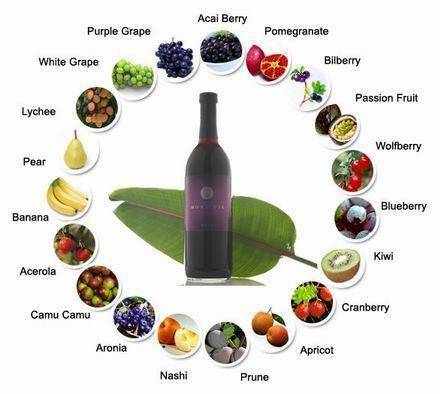 Polyphenols represent a category of more than 8,000 different plant compounds that include simple phenolics, as well as highly polymerized compounds, such as tannins. Bioflavonoids or flavonoids are the best-known polyphenols. Most are derived from citrus fruits and work synergistically with vitamin C and other antioxidants to provide extra protection to the immune system. They also support healthy circulation by helping maintain the walls of small blood vessels. Resveratrol, a bioflavonoid found in more than 70 different plant species including red wine grapes and Japanese knotweed, is known for its heart healthy benefits. Proanthocyanidins and anthocyanidins – bioflavonoids commonly found in red wine and grape seed extracts, as well as in fruits and vegetables commonly found in the Mediterranean diet – have long been known for their capillary and cardio-protective effects. 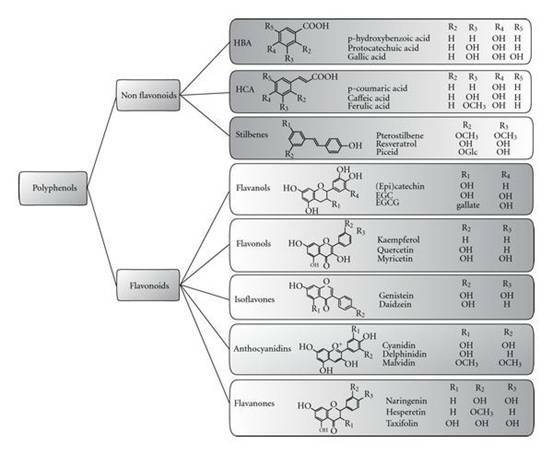 Other common bioflavonoid subclasses are flavones (for example, apigenin and luteolin), flavonols (quercetin, kaempferol and myricetin), isoflavones (genistein, daidzein and glycitein), flavanols (catechins, EGCG and GC), flavanones (naringenin), and glycosides (rutin). Alpha Lipoic Acid – also known as thioctic acid – is a vitamin-like natural antioxidant that is both fat- and water-soluble. Alpha lipoic acid is involved in energy production and aids in recycling the antioxidant vitamins C and E. There is also evidence that it is involved in glutathione production in the liver, supporting detoxification of the body. Dietary sources rich in alpha lipoic acid include flaxseeds, soybeans, pumpkin seeds, and flaxseed, canola and soybean oils. Pycnogenol® is a natural, water-soluble bioflavonoid plant extract concentrated in oligomeric proanthocyanidins (OPCs) and derived from the bark of the European coastal pine, Pinus maritima. This special pine bark is loaded with active bioflavonoids, which are also found in fresh fruits and vegetables. As one of the most potent, natural scavengers of free radicals, Pycnogenol® mops up all kinds of aggressive free radicals before they cause any damage. Its antioxidant capabilities replicate various functions of vitamin C and aid the body by boosting the immune system. It also promotes superior circulation by strengthening the blood vessel walls and capillaries, and prevents stress-induced constriction of arteries. Coenzyme Q10, a fat-soluble vitamin-like substance that is present in nearly all human tissues, is essential for the cellular processes of energy production in the mitochondria. CoQ10 functions as an antioxidant in both the mitochondria and lipid membranes by scavenging free radicals either directly or in conjunction with tocopherol. Ubiquinone is the fully oxidized, non-active form of CoQ10 and the most common. Once ingested and absorbed in the body, the majority is converted to the active form called Ubiquinol. In healthy humans, most of the CoQ10 found in the heart, intestines and liver is Ubiquinol. It also accounts for more than 90% of the CoQ10 in plasma. However, many factors – including the normal aging process, medications and oxidative stress – have been found to compromise Ubiquinol levels in the body. For example, as the body ages, it not only produces less CoQ10, it is less able to convert Ubiquinone into the active antioxidant form. So supplementation of Ubiquinol provides CoQ10 that can be immediately utilized by the body, which is particularly important for seniors whose ability to convert Ubiquinone to Ubiquinol is compromised and athletes who undergo oxidative stress during strenuous physical activity. Dietary sources high in CoQ10 include liver, beef, chicken and some vegetable oils. Superoxide Dismutase (SOD) is considered the most powerful and important antioxidant enzyme for supporting immune function and cellular health. SOD catalyzes the conversion of superoxide radicals into hydrogen peroxide and elemental oxygen. This process is critical to cellular health, in part because it protects cells from excessive oxygen free radicals that can contribute to aging. 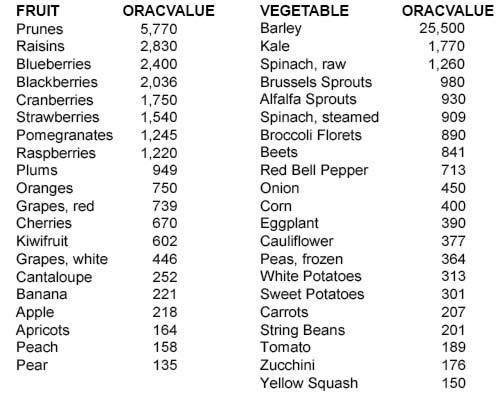 Dietary sources rich in SOD include broccoli, Brussel sprouts, wheat grass, barley and melon. CoQ10, resveratrol, vitamin E, beta-carotene, vitamin D.
Pyrroloquinoline quinone (PQQ), astaxanthin, anthocyanins, resveratrol, L-carnatine. Astaxanthin, anthocyanins, ergothioneine, turmeric, methylsulfonylmethane. Astaxanthin, beta-carotene, vitamin A, vitamin C, vitamin E, selenium. Resveratrol, L-carnosine, silymarin, CoQ10, glutathione (GSH), superoxide dismutase (SOD). Methylsulfonylmethane, vitamin C, vitamin D.
Beta-carotene, astaxanthin, vitamin a, vitamin C, lutein, zeaxanthin, bilberry. Lycopene, milk thistle, N-acetyl-cysteine, alpha lipoic acid, vitamin A, vitamin C, vitamin E.